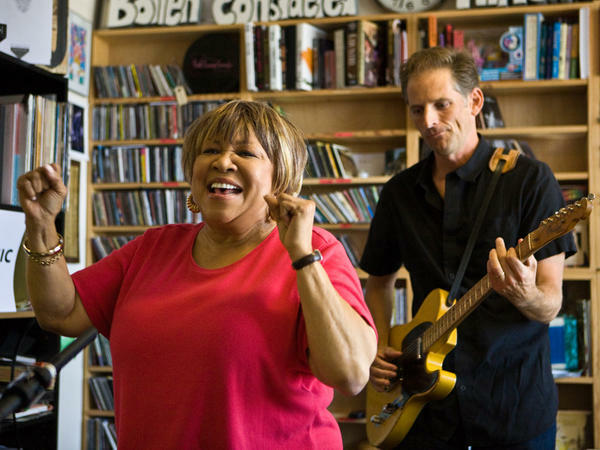 Mavis Staples is a legend, but she's not stuck in the past. You probably know her work with her family band, The Staple Singers, which was all over the radio in the '70s with hits like "Respect Yourself," "Let's Do It Again" and "I'll Take You There" (which she excerpts in her performance here). What you may not know is that Mavis Staples has been actively working with her fellow Chicago musician (and Wilco leader) Jeff Tweedy on her upcoming album, You Are Not Alone. Tweedy produced the record and wrote a few songs for her, as well — including the title track, which she sings here. The album was recorded at Wilco's studio, The Loft, and it includes songs by John Fogerty, Randy Newman, Rev. Gary Davis, Allen Toussaint and Pops Staples. You Are Not Alone also features a fine guest roster, including not only Tweedy (on bass, guitar and vocals), but also Nora O'Connor, Kelly Hogan and Wilco's Patrick Sansone on keys and vibes. Rick Holmstrom, the skilled guitarist who accompanies Staples here, also plays on the record and in her touring band. And while You Are Not Alone doesn't come out until Sept. 14, you can get a good idea of what a treat it is by watching this stripped-down but soulful Tiny Desk Concert.